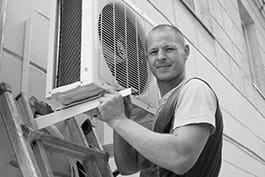 Refrigeration or airconditioning equipment erectors install industrial and commercial refrigerating systems and a variety of refrigeration equipment. Prepare work activities, e.g. read and interpret blueprints and specifications, and gather the appropriate tools and materials. Preassemble refrigeration systems, for example by pre-treating pipes and installing switch boxes. Finish (parts of) refrigeration systems, for example by installing re-encasings. Assemble structural and functional components of refrigeration systems using a variety of tools and techniques. Connect and install structural and functional components of refrigeration systems. Observe and test system operation using relevant tools and instruments.